Lake George Village welcomes the whole family to celebrate the Oktoberfest traditions, music and dancing ~ lots of music and dancing! 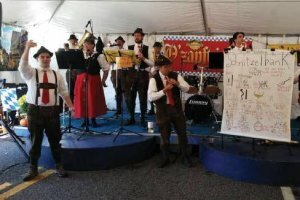 Traditional German Polka bands will be performing ~ be sure to bring your dancing shoes! The Bier Garden, features local handcrafted German-inspired ales, lagers, and beer brewed with New York State hops from Lake George's own Adirondack Brewery. Authentic German food includes Wurst, German potato salad, spatzle and more. You don't miss the Chicken Dance - crowd participation is strongly encouraged. And don't miss the annual cask tapping - O'zapt! More fun includes local artisan vendors, carnival rides, keg tossing, stein hoisting, pony rides, and more! This absolutely free event will be held rain or shine. Children and well-behaved, leashed dogs are welcome. Ladies put on your Dirndl dress or skirt and gentlemen step into your Lederhosen and come to the annual Lake George Village Oktoberfest - Prost!